LAS VEGAS - Since the newest Cirque du Soleil production entitled The Beatles LOVE opened on June 2nd, audiences have been treated to an immersive experience celebrating the exuberant and irreverent spirit of The Beatles, made even more enchanting by the bubbling expertise of Casey Carle. Mr. Carle was chosen by Cirque du Soleil to act as their consultant on a soap bubble based routine featured during the show. 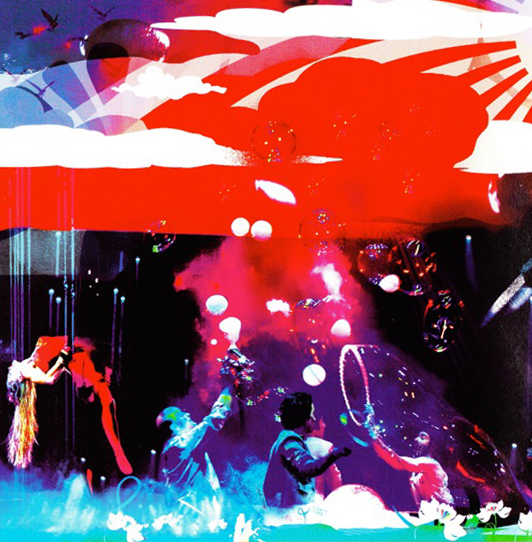 The performance is presented to John Lennon's "Strawberry Fields" and features members of the cast ("Nowhere Men") manipulating soap bubbles, small to massive, from the surface of a grand piano. Cirque du Soleil chose soap bubbles to symbolize the fragility of musical creation (will the song last or will it vanish like a bubble?) and chose Mr. Carle to bring that challenging vision to the stage. For over a year, Mr. Carle spent many weeks with Cirque du Soleil developing and refining bubble routines and training Cirque du Soleil performers to manipulate soap bubbles artistically and expertly on cue. Kathleen Renaud, Artistic Director, LOVE, Cirque du Soleil had this to say: "Casey's expertise has been of great value to the show. He is a skilled teacher and true master of his craft. His professional approach was appreciated by everyone and he had a great rapport with the cast and crew. His dedication motivated the performers and his jovial personality made the workshops light and fun. It was a pleasure to work with Casey and I would certainly recommend him as a consultant." Mr. Carle is also credited with inventing technical ways to make their bubble visions come to life in this live show and developing bubble formulas that do the job expected of them while consistently meeting extremely high artistic standards. The results are a stunningly beautiful, slightly surreal display of fog, lights and undulating spherical liquids that adds a new and dynamic dimension to the repertoire of Cirque du Soleil and to Mr. Carle's accomplishment as a bubble artist. Beyond circus, beyond theatre, Cirque du Soleil has some of the most imaginative performers in the world. For nearly 20 years this "people circus" has thrilled audiences with uplifting antics and movements of indescribable grace. The Beatles LOVE by Cirque du Soleil performs exclusively at The Mirage in Las Vegas, NV. Casey Carle is available to consult on soap bubble projects for stage, screen, tv and commercials. A technical background, performance expertise combined with a connection to a world-wide professional bubble artist community means if he doesn't have the answer he knows where to get it. Let Mr. Carle help you realize your vision.